The Amasi Trio with violinist Prof. Sungrai Sohn, cellist Dr. Chungsun Kim and Dr. Tammy Lum is the resident trio of the Nyack College School of Music. Since the inception of the group in the early nineties, The Amasi Trio has performed a wide range of repertoire from the Western and Asian literature. The group has performed in the Beethoven Festival in New York, the Sarah Lawrence College Concert Series and with the Sarah Lawrence Chamber Orchestra, Carnegie Room Series, the Nyack College Concert Series as well as in young people¹s concerts in the New York area. 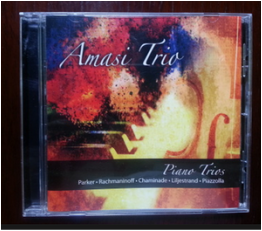 In 2004, The Amasi Trio recorded the "Trio Parables" and "Violinist in the Mall" by composer William Vollinger. The latter piece was elected as the co-winner of the 2005 Friends and Enemies of New Music competition. As the resident trio of the Nyack College School of Music, all the members are teaching faculty in piano, strings, chamber music and String Orchestra. In the summer of 2012, the trio was invited to perform at the Academy of Music Summer Festival. Sungrai Sohn, violinist and conductor, is a founder and first violinist of the Laurentian String Quartet and Amasi Piano Trio, and has performed annually in major concert halls throughout the United States, Canada, Europe, the Far East and Africa. As a chamber musician, Mr. Sohn has collaborated with such eminent artists as Richard Stolzman, Kurt Masur, Eugenia Zuckerman, Gervase de Peyer, Ronald Roseman, Paul Doktor, Hyo Kang, as well as with members of the Fine Arts Quartet, Tokyo String Quartet, Borodin Quartet, American String Quartet and Borodin Trio. He was a Grand Prize Winner in Solo and Chamber Music in Korea and recipient of the Maryland Women’s Club Award, Artist International Award, Jack Kahn Award andHonored Diplomat, Algiers Fourth International Music Festival. Mr. Sohn has acted as a chair-adjudicator for the New York Music Competition since 2000. He has performed as a soloist with many orchestras including the New York Pro Arte Chamber Orchestra at Carnegie Hall, Kennedy Center, and Lincoln Center. As a recording artist, he has recorded for Musical Heritage Society,Soundspells Production, Newport Classics, and Sony Classical. Mr. Sohn was educated at the Peabody Institute -Johns Hopkins University and graduated with the Theodore Martin Award for Excellence in Music. He received his Master’s degree at Sarah Lawrence College as a scholarship student of Dorothy DeLay, where he has taught violin and viola since 1983 and is conductor of the Sarah Lawrence College Orchestra, Director of Chamber Music and String Department. Tammy Lum: Praised by the New York Concert Review for her "Bravura performance...brilliantly light finger work...confident and dramatic, bringing the audience to its feet" at the "Pianomania" concert with pianist, John McArthur at the New York Merkin Hall in 2008, Tammy Lum is a versatile performer, multiple competition prize winner and music educator. As the winner of the 1990 Leschetizky Foundation Competition, Ms. Lum made her U.S. solo debut at Carnegie Recital Hall in the same year. She is a first prizewinner of numerous competitions, including the Competitions of the Five Town Music and Arts Foundation (1990), the Manhattan School of Music Concerto Competition (1988), the Mieczyslaw Munz Foundation Scholarship Competition (1988) and the William Boyd Competition (1987). Other prizes include the New Orleans International Piano Competition (1995), The Liederkranz Foundation Competition (1986), and the Young Keyboard Artists Association (1985). During the summer of 1999, her solo piano music compact disc recording, "My Treasure Box" was released under the label of Hugo Productions, Inc. Her new solo CD, "Ballades and Ballads" and piano trio CD with the Amasi Trio will be released in 2013.